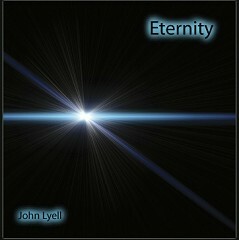 Eternity is John Lyell's second solo release and his fourth release total counting the two releases he did with Brent Reiland from 1998 and 2002. Eternity is pretty much a one man show for John who composed, performed, engineered and produced this new album at Light Year Studios in Minneapolis, MN. Heck he even did the graphic design, the layout and the art concept of the project as well. The only thing that was outsourced so to speak was the digital mastering which was done by another well-known talent in the ambient music field in the person of Robert Rich in his Soundscape Studios in Mountain View, CA. John has included 10 wonderful tracks on this release with only two of them falling below the 6 minute threshold so listeners are in for some excellent long form pieces that will allow them to really enter into each composition and into the album as a whole. The album runs a little over an hour at 63:17. First off let me say that I love this album as a whole. The compositions are well suited to each other and even as the tempo occasionally changes it does not disrupt the flow of where the music wants to take you. John has created some fantastic otherwordly moods on this album which envelopes you in densely atmospheric soundscapes that massage the mind allowing you to open to the journey before you. The song titles tell me that the journey is one that could be an extra planetary voyage beyond this world or perhaps a journey within yourself as you contemplate the meaning of eternity or exactly what forever might mean to you. Either way the music is well suited to providing a soundtrack to that journey because whether you journey within or without the compositions stir just the right kinds of emotions as you listen. The album starts with a deep spacey kind of song called Eternity. It is a contemplative and peaceful song that allows the listener to untether themselves from their day to day worries and enter in fully to the world that John has created with this album. It is fitting that this is also the title song of the album as well since it does indeed set the pace for what is to come. I have always enjoyed pieces that engage me as a listener and invite me to "hear" the music actively instead of lurking passively in the background while I am busy doing something else. Don't get me wrong I also enjoy purely ambient music that requires nothing of me other than to load the disc in my player and go about my business letting the music break into my consciousness whenever I have a break in what I am doing. It's just that I have always liked to pay attention to what I am listening to whether that is the lyrics in a new rock song or a layered piece of ambient/space music by John Lyell. By the way Eternity is one of my favorite songs on this album. Of course I could probably say that about most of the songs on here but this one does stand out to me. The song has a mysterious haunting quality to it that evokes images of unfamiliar waters or uncharted space all the while creating a sense of adventure in the back of your mind about where the music will ultimately lead you. Some of my other favorite tracks from this release are Dreams of Orion, Pulse of Destiny and the closing song called The Breath of Time. Pulse of Destiny is the first song that you might say has a beat or some sort of rhythm. The repeating rhythm that flows through this whole song is an apt way of looking at destiny in that it illustrates perfectly the inevitable movement of things and events towards a predetermined conclusion. While this pulse is moving the song forward you will also hear water sounds along the way and other synths that punctuate the journey adding some sonic variations to the landscape. Another interesting song that actually caused me to write to John on first listen was Vector Atmospheres which is track three on this CD. After repeated listening’s I understand it now but I thought that there was some unintentional static on this track at first. John explained that it was meant to be there and that he used a Synth Patch to create it. So for the first time through just be aware that the static is meant to be where John placed it. John has created in Eternity an album that is intimate and inviting and that is instantly engaging to the listener. John has expertly woven a musical tapestry with the songs on this CD that creates a relaxing atmosphere that caresses those listeners who delve deeply into the compositions. John's musical sensibilities have been honed to a sharp point over the last decade and now he is comfortable crafting cohesive artistic visions like you will find on his latest release. The lush landscapes that John has created on this release are very revealing of his heart and underscores his impressive skills as a musician and producer. This album is very accessible and quite an enjoyable way to spend a few hours. That presupposes that you will want to listen to it several times the way that I did hence the few hours instead of just one. This album is due out on March 20, 2012 and you would do well to get your own copy to set out on your own journey. And of course this release is highly recommended by Ambient Visions.